This attractive and well-presented two bedroom mid terrace residence would make an ideal family home boasting neutral décor, gas central heating system and a new roof having only been fitted 2016; which is a major long-term advantage! Ready to move into, unpack your boxes and start enjoying, plus the benefit of being sold with no chain, this lovely home would certainly appeal to the first time buyers out there. Situated in a convenient area near to the shops and amenities in Poulton and Liscard. Well placed for local schooling and frequent bus routes direct to Liverpool and Birkenhead from Poulton Road itself. Also just a short drive to the M53 motorway and Liverpool tunnel. Interior: vestibule, hallway, living room and dining room open plan to the kitchen on the ground floor. Off the first floor landing there are the two bedrooms and bathroom. Exterior: rear courtyard area. Call our office today to book in your viewing; do not delay! 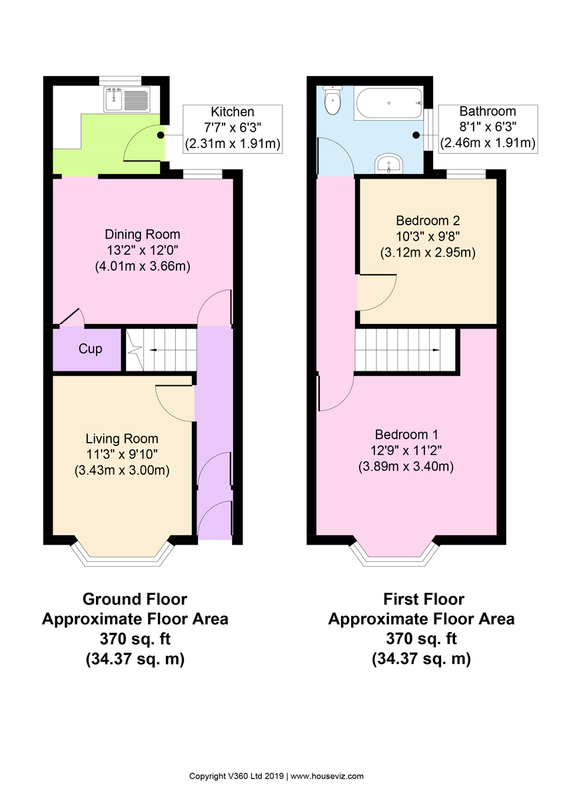 LIVING ROOM 13′ 1″ x 9′ 9″ (3.99m x 2.97m) uPVC double glazed bay window to front elevation. Coved ceiling, picture rail and dado rail. Feature fireplace with coal effect living flame gas fire set on a marble hearth and back. Two wall light points, television point and telephone point. Central heating radiator. KITCHEN 7′ 7″ x 6′ 3″ (2.31m x 1.91m) uPVC double glazed window to rear elevation. Matching range of white base and wall units with white porcelain handles and contrasting work surfaces. Stainless steel sink and drainer with mixer tap over. Cooker point, tiled splash backs and wall mounted boiler. Space and plumbing for washing machine with further space available for a fridge. Part glazed external door leading out into the rear garden. BEDROOM ONE 13′ 0″ x 13′ 0″ (3.96m x 3.96m) uPVC double glazed bay window to front elevation. Coved ceiling, picture rail and central heating radiator. Original cast iron feature fireplace with beautiful tiled hearth. BEDROOM TWO 10′ 2″ x 9′ 8″ (3.1m x 2.95m) uPVC double glazed window to rear elevation. Picture rail, central heating radiator and laminate flooring. BATHROOM 7′ 6″ x 6′ 3″ (2.29m x 1.91m) uPVC double glazed frosted window to side elevation. Suite comprising panel bath with shower attachment, close coupled WC and hand wash basin set into a storage unit. Dado rail, central heating radiator and part tiled walls with wood effect vinyl flooring to finish. EXTERIOR Ideal for relaxing in especially during the warmer weather, the rear paved courtyard area has brick built boundary walls and an access gate. LOCATION Greencroft Road can be found off Poulton Road, approx. 0.9 miles driving distance from our Liscard office.